Miss Minnesota's Outstanding Teen 2012! : Ruby's Pantry. 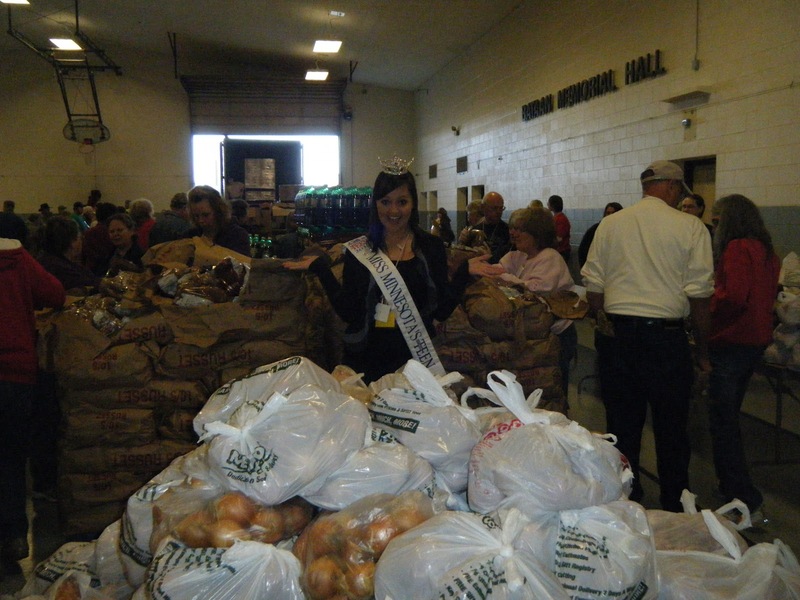 Yesterday, I was at the National Guard Armory in Brainerd to help distribute food for Ruby's Pantry. 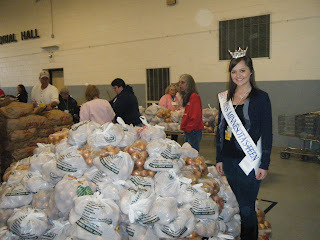 Ruby's Pantry is a Christian organization that helps fight hunger and poverty in the community in which it is held in. Many food distributors (like Coca-Cola, Barrel O' Fun, etc.) donate food that is a day old or overstocked for use in Ruby's Pantry. This organization in not income based, so anyone who feels the pressure of high prices at the grocery store is welcome! You pay $15 and that gets you a "share" and an extremely large portion of food. Since all of the food is donated, the entire $15 dollars you just payed goes to help local food shelves and non-profit organizations (like Teen Challenge) right here in Brainerd. Every months, I see more that 400 (sometimes 500!) shares get distributed, and I always think about how many people are benefiting from this amazing program. I've been blessed to have been able to attend the past 3 months (it's always the second Tuesday of every month). The people are starting to recognize me.. which is awesome! They all knew me as Miss Brainerd Lake's Outstanding Teen, so when I walked in with a taller crown and a new title they were extatic for me! They couldn't believe that a Brainerd girl is now representing the state of Minnesota as Miss Minnesota's Outstanding Teen. Many people had recognized me from a huge article and picture in the Brainerd Dispatch, and it was fun chatting with them about my future year and where this crown will take me. Which leads me to my other thought: I am feeling like the luckiest girl in the world, and I want to make sure that Minnesota knows how honored I am to be representing them. I've put years into preparing for this year, and already it's been everything I wanted it to be and more. Thank you to those who have been supportive over my journey. You will hear me say that alot, but I truly am grateful for the support and love. Thank you is simply not enough for what you have done for me. And I helped bag all of them!